Denver is the central city of a conurbation region in the U.S. state of Colorado. The conurbation includes one continuous region consisting of the six central counties of Adams, Arapahoe, Broomfield, Denver, Douglas and Jefferson. The region includes the adjacent county of El Paso in the south and reaches to Fort Collins, Larimer County in the north. 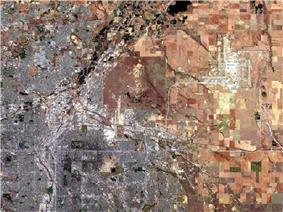 The Denver region is part of the Front Range Urban Corridor. 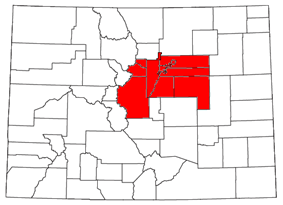 The United States Office of Management and Budget has delineated the Denver-Aurora-Lakewood, CO Metropolitan Statistical Area consisting of ten Colorado counties: the City and County of Denver, Arapahoe County, Jefferson County, Adams County, Douglas County, the City and County of Broomfield, Elbert County, Park County, Clear Creek County, and Gilpin County. The United States Census Bureau estimates that the population was 2,645,209 as of July 1, 2012, an increase of +4.00% since the 2010 United States Census, and ranking as the 21st most populous metropolitan statistical area of the United States. The Office of Management and Budget also delineated the more extensive Denver-Aurora Combined Statistical Area comprising the Denver-Aurora-Lakewood Metropolitan Statistical Area, the Boulder Metropolitan Statistical Area, and the Greeley Metropolitan Statistical Area. The percent population change from April 1, 2010, to July 1, 2011. The most prosperous parts of the area are in the south, while the most industrialized areas are in the northeast, specifically in the northern part of Denver proper and extending to areas such as Commerce City in Adams County. Changes in house prices for the area are publicly tracked on a regular basis using the Case–Shiller index; the statistic is published by Standard & Poor's and is also a component of S&P's 10-city composite index of the value of the residential real estate market. The center of the metropolitan area sits in a valley, the Denver Basin, and suffers from air pollution known colloquially as the brown cloud, building up if the air is stagnant as it often is in the winter. Severity of pollution in this area has varied enormously over the years. In the late 1980s the area was frequently in violation of multiple National Ambient Air Quality Standards established by the United States Environmental Protection Agency (EPA). The Regional Air Quality Council (RAQC) was formed in 1989 to create plans to address the problem. Through a variety of measures the area's air quality was improved and in 2002 the EPA designated the area in compliance with all federal health-based air quality standards. Denver was the first major city in the United States to reach compliance with all six of these standards after previously violating five of them Since then the EPA introduced a new standard for small particulates and made the existing ozone standard stricter. In 2003 the new ozone standard was frequently exceeded in the area and was occasionally exceeded as far away as Rocky Mountain National Park. The RAQC hopes to implement plans enabling the area to comply with the new standards by 2007. Though Arvada, Aurora, Boulder, Brighton, Broomfield, Denver, Lakewood and Longmont have their own individual sister city relationships, the Denver Regional Council of Governments (DRCOG) as a whole has a sister city relationship with the Baghdad Governorate of Iraq. ^ a b "OMB Bulletin No. 13-01: Revised Delineations of Metropolitan Statistical Areas, Micropolitan Statistical Areas, and Combined Statistical Areas, and Guidance on Uses of the Delineations of These Areas". ^ "Colorado Counties as of May 1, 2011". ^ "Town of Bennett - Government". Colorado.gov. Town of Bennett. Retrieved 1 January 2014. ^ "Bagdad–Denver region partnership". Denver Regional Council of Governments. Retrieved 9 August 2010.